Meghan Murphy has an opportunity to take her violin on the road. 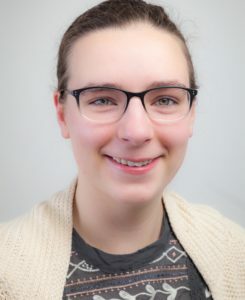 The Lawrence University senior from Wauwatosa was notified Friday that she is one of 41 national recipients of a Watson Fellowship for a year-long wanderjahr of independent travel and exploration. Like all applicants, she has a grace period to decide if she will accept it. Based on her Watson application, she would head to India, Norway, Azerbaijan, Ireland and Mexico to explore musical traditions that incorporate violins and violin-like instruments. “From the Azerbaijani kamancha to the Norwegian fiddle, similar physical tools express vastly contrasting styles of music,” Murphy said in her Watson statement. “Whether for dance or lullabies, these instruments allow people to create community and speak their souls. The violin is deeply ingrained in my own cultural and emotional experience. Murphy, who has been a recipient of the Kim Hiett Jordan Scholarship at Lawrence, is the 66th Lawrentian to win a Watson fellowship since 1969. Murphy is studying violin performance and religious studies at Lawrence. She is part of the 51st class of Thomas J. Watson Fellows. The Watson provides funding for a year of purposeful international discovery for graduating college seniors in any discipline. This year’s class hails from six countries and 18 states, and fellows will travel to 76 countries exploring a wide range of topics. Brian Pertl, dean of the Lawrence Conservatory of Music, said Murphy’s curiosity of music and of the world around her would serve her well on a year-long Watson journey. Murphy admits she had a bit of a love-hate relationship with the violin during childhood. But by the time she reached high school, she was fully hooked on what she calls the “emotional messiness of music.” And during a year of study in China between high school and enrolling at Lawrence, she had a moment that spoke to the power of the music she is so drawn to. “I think about the time when I was homesick in southern China and began playing Bach’s Chaconne in my room,” Murphy wrote in her personal statement, part of the Watson application. “An old woman from a nearby village heard and came to listen. I did not understand her village’s language and she could not read or write, but she showed me pictures of the beautiful Batik art she creates and I played for her. It was an incredibly meaningful moment of shared humanity. Murphy anticipates more emotional connections via music as she prepares for a year of study that would take her around the globe. According to her project proposal, she plans to first head to Norway in September, where she would study the hardanger fiddle. She’d be there for about three months, and would be seeking opportunities to perform with local music groups. “When I was young, I used to attend barn dances and was enchanted by the echoing sound of this fiddle,” she said. She would then head to Pune, India, located on the western side of India, where she’d study the Hindustani violin. Next would be a visit to Baku, the capital of Azerbaijan, where she would study the kamancha, an instrument similar to the Chinese erhu. Her last stop would be in Ireland, where, among other things, she would learn traditional Irish fiddling and to better connect her violin to dance. “Learning new styles of music will expose me to the histories, languages, values, and cultures of many countries,” Murphy said. “As I continue my path in pursuit of failure and growth, I will also improve skills like improvising, learning by ear, and collaborative composing. APPLETON, WIS. — Madhuri Vijay wants to violate the first rule of writing: write what you know. Having spent the past four years as a student at Lawrence University, Vijay knows what it’s like to be an Indian living in the United States. But the senior from Bangalore, India, wants to explore what life is like for her countrymen living in other countries. Nearly 1,000 students from 47 selective private liberal arts colleges and universities annually apply for the Watson Fellowship. Vijay will use her fellowship to travel to Fiji, often referred to “Little India” because of its large Indian population, Kuala Lumpur, Malaysia, which has had contact with India since the 15th century, Durban, South Africa, where Indian leader Mohandas Gandhi established the Phoenix Settlement for Indians who wanted to peacefully resist oppression, and finally Tanzania, which boasts two distinct Indian populations: one that was born and raised there and one that has recently arrived. Tim Spurgin, associate professor and Bonnie Glidden Buchanan Professor of English, who serves as Lawrence’s campus liaison to the Watson program, calls Vijay “a perfect choice” for a Watson Fellowship. During her global travels, Vijay will explore what Indian customs and traditions these people still cling to, what aspects of their new country they’ve embraced and how they balance the cultural line of being native Indian with being Tanzanian, Fijian or Malaysian. In addition to helping define her own personal identity, Vijay sees her fellowship opportunity as a litmus test for her passionate, but largely unspoken, ambition of being a writer. If she wasn’t previously a believer in the axiom “first impressions are lasting impressions,” Vijay surely is now. The Watson selection committee started their interview process this year at Lawrence last November and Vijay was the very first of the 177 finalists to be screened. Vijay is the 67th Lawrence student awarded a Watson Fellowship since the program’s inception in 1969. It was established by the children of Thomas J. Watson, Sr., the founder of International Business Machines Corp., and his wife, Jeannette, to honor their parents’ long-standing interest in education and world affairs. Watson Fellows are selected on the basis of the nominee’s character, academic record, leadership potential, willingness to delve into another culture and the personal significance of the project proposal. Since its founding, nearly 2,600 fellowships have been awarded.